Next I’m hitting up the Search & the C-Level Executive track with an intro by Bryan Eisenberg, SES advisory board member and co-founder of Future Now, Inc. Amanda Watlington, owner of Searching for Profit, is giving the sole presentation. Bryan says that when he was asked to introduce this track he was excited because Amanda is the author of the first version of “Call to Action” and is someone with great depth of knowledge in the field. Amanda asks who is at their first SES conference. She says one of the problems with the conference format is that sessions are a dive into a micro topic. You walk away and don’t know how to put all the pieces together. This session is going to help you put it all together from a macro view. 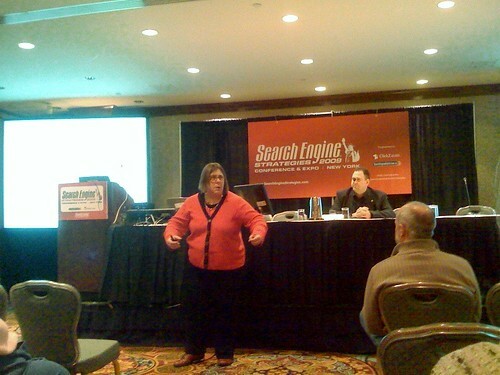 Content and site design enhancement to achieve relevant rankings on SERPs = search result pages. SEO is a long term effort with long term results. SEM is short term efforts, often referred to as “campaigns”. Inclusion of social media in search is expanding the footprint of search and the overall dollars spent. Even Google is anticipating declining revenues. Search is expected to grow 8-10% even in the current down economy. When she first started in search (1995), all you had to worry about was the page for a slew of engines. In 2007 there was a major change in how the model worked. Google announced its universal search model on May 16, 2007. Yahoo followed soon afterward with blended search. Images, news, video and local info are now being delivered in one easy-to-use increasingly personalized interface. Now to get on the page you have to add to the clutter. The top result for a “coldplay” search is a news story, then the official site with site links. Then there’s a Wikipedia result. Then videos, social networking sites, multimedia sites then blogs. Video is the current darling of search. Eye tracking has shown that eyes go to the images on the SERP. Every part of multimedia can be optimized. Search is not just your Web site. You can control blogs, video, the news, some social sites, images, articles and site content. How Has This Changed the Management of Search Marketing? SEO was assigned to a specialist with a narrow set of expectations and tasks all framed similarly around visibility for the target site in search engines and directories. SEO was a (difficult) collaboration of the webmaster, IT and marketing/content stakeholders. SEO agencies were tasked with achieving search engine rankings and traffic. SEO must be the visibility manager, the digital asset performance optimizer, not a soloist. Video, images, news, products, maps, local search and mobile search go beyond the role and skills of most traditional SEOs and many traditional search agencies. Video: Which department has a videographer and editing suite? Images: Who owns them — product, merchandising or content team? With co-content creators, search must develop protocols for optimization of various new types of content. Search must create new checklists and procedures to ensure that other collaborators’ efforts work in sync. SEO must be collaborator and boundary0spanner. Must have sponsorship at the highest level to accomplish results. Must be prepared to function as a manager, not just an implementer. Organizational challenges — whether in-house or agency — stay the same. 5 minutes after a TV spot airs, there is an increase in searches for that product or brand on the Web. Display advertising influences conversion on natural search. To achieve maximum power, the goals must be clearly articulated. Budgets must reflect the revenue impact. Set aside a portion of the marketing budget for new, experimental endeavors. Develop marketing results attribution models now, if they are not already in place, to clarify which marketing efforts should get the credit. Make sure there are appropriate metrics for measuring all channels. Use data from search-driven marketing efforts to create models for consumer behavior for your business. Challenge Web analysts to bring in and integrate multi-stream data. Avoid dashboard blindness — send divers deep while navigating from the top level. She has two role and responsibility decision models. I can’t get them both down but she’ll be making these slides available and I may just swipe it then. Check back later! Using a decision-making model for search begs clarification of how things really work in the organization. With everybody on board, a decision model will keep things working forward and avoid friction. Improve the performance of paid search through testing of landing pages. Focus on improvements to conversion that will increase revenue. If you were unable to afford to buy or had to cut PPC ad spend by X% after a certain date, what would happen to our online presence, sales, branding, etc.? How should you measure the effectiveness of a PPC campaign? Organic search? What in the org/Web site is limiting search performance? What skills or training do you need to do your job more effectively given the changing nature of search? What’s the impact of offline advertising on online results? What percent of overall ad/marketing budget does the online presence warrant? What must you do to improve the effectiveness of search relative to conversion? What is the expected conversion rate for the site, how is it measured and how does it compare to the rest of your industry? Who is not included in the current search marketing team? What can you do as a manager?